I planned to write more letters as I went on in my mission, but because I came home I didn’t have much else to say. Still, right before she came home a few weeks ago I decided that I wanted to write one more for her plane ride home. I talked about some of the basic things about coming home, but mostly I talked to her about how she should’t feel like she’s getting a demotion. I told her that she was getting a promotion. I was in a little bit of a weird mood that day and I wrote about how she’s been in “the Lord’s boarding school” and now she’s been fully trained to go out as undercover missionary. I told her that she was still a missionary and that she had a calling to continue sharing the gospel in her life even after she took the name tag off. Member missionary work is one of my biggest passions. I had an experience on my mission that left me feeling very strongly that I had been called as a missionary to help the members do missionary work. I saw amazing things happen when members did as the Lord asked to be missionaries around them. Then, when I came home I felt like I had missionary work taken away from me so I was desperately looking for opportunities to still do missionary work. Realizing that i was still a missionary was a big step to helping me feel better about being home. If you’re from Utah or another area with a lot of members, you might not feel like there are a lot of ways to do missionary work. I felt that way when I came home. I was wrong. Remember Elder Andersen’s talk from a few conferences ago? Among other things, he said, “If you’re not a full-time missionary with a missionary badge pinned on your coat, now is the time to paint one on your heart—painted, as Paul said, “not with ink, but with the Spirit of the living God.”13 And returned missionaries, find your old missionary tag. Don’t wear it, but put it where you can see it. The Lord needs you now more than ever to be an instrument in His hands. All of us have a contribution to make to this miracle.” Someone called as a messenger of God has said that YOU are needed. Even those of us who came home early. Perhaps even especially those of us who came home early. There is a lot I could talk about in relation to missionary work. I could talk about family history. Indexing. Online missionary work. Going out with your local missionaries. And all of those are terrific options to help you still be a missionary now. I’m sure I’ll discuss those eventually. But today I want to talk about a specific kind of missionary work that I feel we should be paying attention to. I’ve shared before about how when I moved to Provo my new ward took me and loved me back to health and happiness. What I don’t often talk about it how they also loved me back into the gospel. Before I moved, I was at the point of giving up. Giving up everything. And a big part of that was the church. I hated to go to church more than I hated anything else. I went to church and wondered if lepers felt the way I did. I felt unclean, unworthy, and unwanted. I knew the gospel was true. I didn’t doubt that. But I did doubt that I had a place in the gospel and that I was worthy of being a part of it. Then I moved to Provo. This ward took me in and loved me, even though the best word I can use to describe myself at the time is “broken”. They didn’t judge me for coming home early. They didn’t care that I was struggling with depression because of that, or that I was barely hanging on. They just loved me. They made me one of them. They invited me to things. They brought me treats. They came home and visiting teaching. They talked to me. The smallest smile. One person saying hi to me. Those things meant everything to me. Those things saved me. I started to feel like if these mortal people could look past how broken I was and love me, then Christ could love me too. And maybe someday I could even love myself. Through their simple actions of Christlike love, things that probably weren’t a big deal to them, they led me back to Christ. They helped me feel Heavenly Father’s love for me. That love led me to the atonement and to the healing I desperately needed. I can’t talk about what that ward did for me without tearing up. They will never know just how crucial their actions were. If it weren’t for them, I would not be here. I have been so grateful during the past year of my life for a God that is willing to take us in our imperfect condition and help up lift each other. I am so grateful for the healing power of the atonement that can replace grief and pain with joy. Looking at me now, most people would have no idea how close I was to giving up on everything because of how much it hurt. And it was all because of some individuals who decided to love me, even when I wasn’t easy to love. I think that this is some of the best missionary work that we can do right now. Just because someone is at church every Sunday doesn’t mean that they don’t need “missionaries”. And that is our job. I firmly believe that sometimes the people who need “missionaries” the most are the people who are there at church every Sunday. Particularly for those of you going to a singles ward, think of how much the people our age are going through. We’re making decisions about dating, school, and careers. In short, we’re deciding who we are going to be for the rest of our lives. Sometimes this means that we’re deciding if we want to be a part of this church. So many of us get lost in how confusing the world can be. There are so many people around us who have “sorrow that the eye can’t see” in our hearts. There are so many of us who are hurting. So many of us who are feeling lost and alone. Yes, we might have come home early. We might feel like we weren’t the kind of missionaries that we desperately wanted to be. We might not have had as much time in the training grounds that are full time missions. But we still can help people. Your coming home early did not mean that you can never have an impact or act as a representative of Christ ever again, even if it occasionally feels like that. And I can promise you that there are people in your ward and in your circle of friends right now that need you. They need YOUR stories and experiences. They need who you are. I know that Heavenly Father puts us with certain people so that we can help each other. I challenge you to look around you. Look at the people you have classes with. Look at your coworkers. Look at your friends. Whether they are members of the Church of Jesus Christ of Latter-day Saints or not. I promise you that there are people around you that Heavenly Father has sent to you so that you can love them back to health. 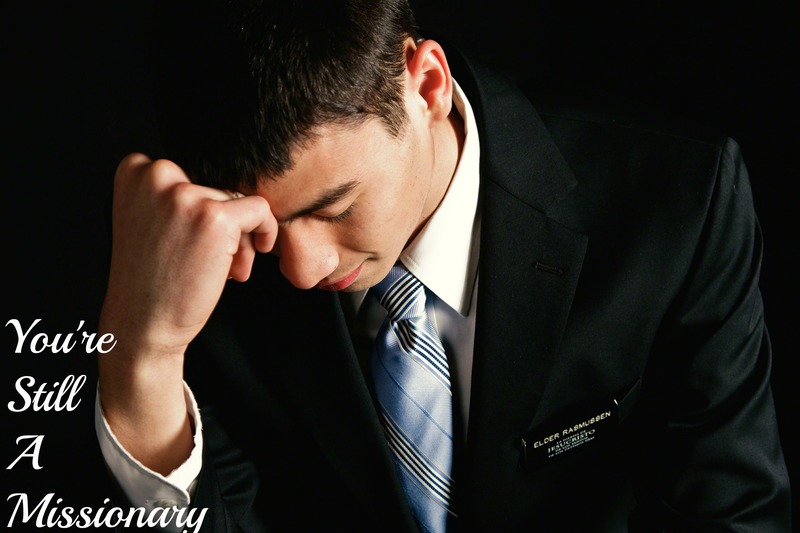 Just because there’s no longer a name tag on your chest doesn’t mean that you’re excused from missionary work. People out there need you. There are people that only you can touch. Get out there and get to work.